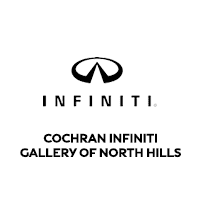 When you choose Cochran INFINITI Gallery of North Hills, you’ll receive a streamlined INFINITI financing experience that ensures you enjoy INFINITI ownership right from the start. From first-time buyers to longtime customers, the team at our INFINITI dealership near McCandless, PA, will provide each guest with honesty and transparency every step of the way. We’ll help you apply for INFINITI financing if you need to secure an auto loan, or we can show you the many INFINITI lease options available to you. No matter what, our INFINITI finance specialists have your best interests at heart. View the new INFINITI finance specials and INFINITI lease incentives at Cochran INFINITI Gallery of North Hills to enjoy exclusive savings. From new INFINITI QX60 lease offers to new INFINITI Q50 finance incentives, we have everything you need. Want to trade in your current vehicle and upgrade to a new or used INFINITI model? We’ll give you a competitive offer for your trade-in and help you get the keys to the new INFINITI SUV or sedan you love. Come to Cochran INFINITI Gallery of North Hills for professional INFINITI financing!